Abnormalities affecting the teeth are commonly encountered in the dental office. They are best understood from the developmental point of view, since they occur during morphogenesis, hence described as developmental disturbances. Two such disturbances occurring in a rare combination are: dens invaginatus and talon's cusp. Dens invaginatus (dens in dente, dilated composite odontome, etc.) is a developmental anomaly resulting from an invagination in the surface of the crown or root before calcification has occurred. The invaginatus may vary from a slightly accentuated lingual pit to deep foldings reaching to the apical foramen. It can affect both primary and permanent teeth and its prevalence is reported to be 1.7% - 10%. All the published studies found that maxillary lateral incisors were the most commonly affected teeth, followed in descending order by permanent central incisors, canines and molars. On the other hand, talon's cusp, so named because it resembles an eagle's talon, is an uncommon anomaly that occurs as a nodule or tubercle. 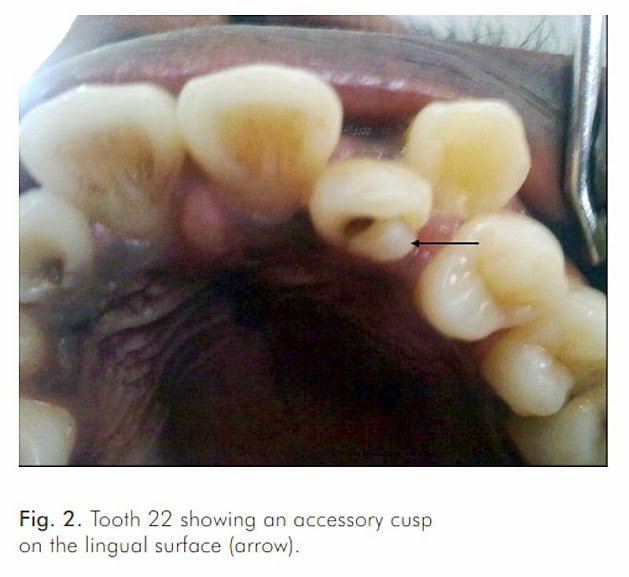 This cusp is composed of normal enamel, dentin and varying extension of pulp tissue. It occurs with a frequency of 0.04-1.05%, with the maxillary lateral incisors showing the maximum predilection. Clinically it ranges from an enlarged cingulum to a large well-delineated cusp extending beyond the incisal edge of tooth. Based on the degree of their formation and extension, the anomaly can be classified as - talon, semi-talon and trace talon. This was later modified as type 1: major talon, type 2: minor talon and type 3: trace talon.